"World belongs to the Children"
The project's major concern is to provide a safe and caring environment for the children, where both their psycho-social, as well as physical needs are addressed. Keeping this in mind Rupayan wants to fulfill the need of these underprivileged children (the limited numbers that can be accommodated at present) by providing knowledge, information and guidance which will enable children to transform negative emotions into positive one and will help to cultivate the human values that the children are inherently blessed - their innate creativity is to be enhanced through setting up a Residential Institution, Day-care Centre in the community and Vocational Training Centre. The children reaching to their adulthood will venture outside to stand on their own. Rupayan is an annexe to VVM De-addiction Research Centre – which is under The Art Of Living. Today's children (the unfortunate ones) are getting stress, tension, violence, hatred and unfriendly behavior – specially children residing under difficult circumstances (those who are staying on streets and railway platforms), are accustomed to face the harsh reality each and every day. Their regular interaction with the stressful circumstances make them more traumatized, which makes them hostile, aggressive and they often develop unsocial attitude towards others. 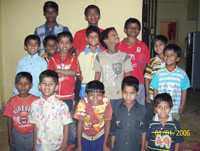 Sometimes these children get engaged in high-risk sexual activities, drug intake, etc. which makes them vulnerable towards drug addiction, HIV / AIDS infection and other diseases. Children lose their inborn quality because of the circumstances of life in our society, facing the stark reality for survival from the time their senses start working, being deprived of proper knowledge, guidance and information and above all any proper help from own society. 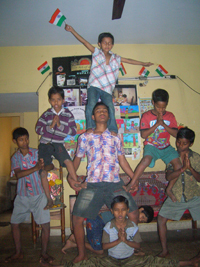 To bring about total lifestyle development in the underprivileged children with holistic approach for their upliftment. To follow H. H. Sri Sri Ravi Shankarji's quote — "Just information is not education. It is culturing our behaviour and attitude. It is our ability to perceive things better. Perception, Observation and Expression – the three aspects of education have to be improved." Rupayan's mission is to provide proper education to the underprivileged children, will help them not to become unsocial elements in our society and thereby it will be contribute to our society for a safe and healthy living. 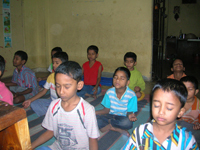 To provide proper education to improve behavior and attitude with improvement of their perception, observation & expression. To create awareness about ill-effects of substance abuse to the individuals, the family and the society at large. To evolve and provide a whole range of community based services for the identification, motivation, detoxification, counseling, aftercare, rehabilitation and vocational training for child addicts. 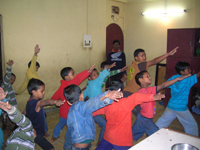 To bring about all round development in the underprivileged children with congenial environment and therapeutic input/classes necessary for their up-liftment. To promote collective initiatives and self-help endeavours among individuals and groups vulnerable to addiction & STS / HIV / AIDS. To establish appropriate linkages between voluntary agencies, working in the same field and Government organizations. Non-formal Education & Formal Education. Free Medical Facilities including Medicine. Skill Building Activities — (1) Art & Craft (2) Art Excel Course (3) Yoga (4) Physical Exercise (5) Dance with Music & Songs (6) Drama (7) Games & other activities.